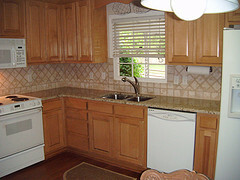 A backsplash is the area of the wall behind a sink or stove, typically located in the kitchen. The area, which is usually covered with a different material than the rest of the wall, serves an important functional as well as aesthetic purpose. Practically speaking, it serves to prevent liquids and other items from falling behind the wall, and creates a stain-resistant, easy-to-clean surface. Stylistically, it can transform the look of a kitchen, bathroom or bar, by adding a unique artistic flourish and vibrant, dramatic colors. If you’re not looking to do a major remodel, but your kitchen could use an improvement, a new backsplash can work wonders and change the feel of your kitchen. There are many backsplash options, each with its own advantage and distinct look. Ceramic tile, however, is the most popular choice, both for its durability as well as its wide variety of styles and colors. On average, a square foot of ceramic tile will cost between $2 and $20, though higher-end tiles can cost two or three times as much. While it’s possible to install tile on your own if you have some experience, backsplash tile is a little trickier than other tiles. Because the area is smaller and the tiles are not always standard sizes, and because you may want to install special artistic features, it’s recommended that you hire a professional tile-installation expert to do the job properly and efficiently. Installation can cost an additional $5-$25 a square foot, depending on the complexity of the project. You can install basic tiles in a plain or checkered fashion, or alternatively, you can place them diagonally for a more artistic look. Other, more creative options are available, such as a mosaic, subway, or trimmed patterns. A mosaic tile is a large area made up of small tiles, usually one square foot. These tiles are each about one square inch, and are mounted on a mesh sheet. The sheet typically costs between $5 and $20. Subway tiles are rectangular-shaped tiles that are half as narrow as they are wide. They get their name from the New York City subways, where tiles of the same parameters have been used as station signs since the early 20th century. They usually run between $5 and $15 per square foot. Trimmed tiles are a band of tile that borders your backsplash with a distinct look. These usually come in strips of tile that are about 2 or 3 inches by 11 or 12 inches, and normally cost between $3 and $10 each. If you have a tight budget, there are a number of ways to cut the cost of backsplash tiles. One way to get an inexpensive yet stylistic backsplash is to install a simple, reasonably-priced tile for the main part, and add a different, more unique trim. Another option is to install the backsplash just in the counter area or wherever you think you need it most, and not along the entire kitchen wall. A backsplash is an appealing feature that adds functionality and beauty to any kitchen. No only will it make cooking and washing dishes more enjoyable, it will also add value to your home.